Thanks to Wolverine's incredible healing powers that keep him looking young no matter how old he gets, it's been kind of hard to figure out exactly where the character fits on the X-Men: Days of Future Past timeline - and director Bryan Singer's Twitter set photos aren't really helping. The filmmaker first teased star Hugh Jackman's arrival on set back in late April, when X-Men trilogy castmmates like Sir Patrick Stewart, Sir Ian McKellen, Anna Paquin and more were on set, and then a couple of weeks later he was shown walking down a hallway with X-Men: First Class' Nicholas Hoult. It's hard to guess what kind of role the clawed mutant will be playing in the story, but if this brand new Twitter image suggests anything it's that Wolverine and Beast are going to be seen spending a good amount of time together. 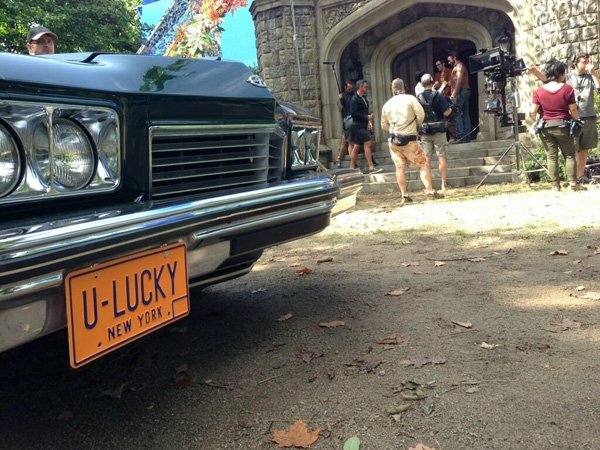 This new image from the set, once again posted on Singer's Twitter, wants you to look at the car's license plate that reads "U-Lucky," but staring into the background you can clearly see both Jackman and Hoult standing in the doorway of some kind of stone arch. Sadly, the message that came along with the shot - reading "The countryside at last. #XMen #DaysOfFuturePast" - doesn't really help us figure out exactly what is going on in the scene. I suppose it's possible that this is just one of the exits of Professor Xavier's School for Gifted Youngsters - the setting of the last photo featuring Wolverine and Beast - but that would really depend on one's definition of countryside. Scripted by Simon Kinberg and Matthew Vaughn, X-Men: Days of Future Past begins in an apocalyptic future where the surviving members of the X-Men struggle to survive regular attacks from giant, government-built robots called Sentinels. In order to prevent the series of events that led to the Sentinels' creation, the team devises a way to send one of their own back in time to 1973 where they can try and stop a catastrophic event from occurring. In addition to the actors mentioned above, James McAvoy, Michael Fassbender, Jennifer Lawrence, Shawn Ashmore, Ellen Page, and Daniel Cudmore will all be reprising their roles from previous X-Men movies while new additions to the cast include Adam Canto, Peter Dinklage, Omar Sy, Booboo Stewart and Fan Bing Bing. The movie won't be coming out until Memorial Day weekend next year, bumped up from its original date in mid-July, so it will be a while before we get to see the movie's first trailer...but it won't be long until we see the first footage. While 20th Century Fox is keeping details about their San Diego Comic Con panel a secret for now, Singer has already promised that his new movie will be bringing something special to the event. We can't wait.